Snapshot: This Toro Recycler 22" AWD Personal Pace Self-Propelled System 20353 is a self-propelled mulch & catch petrol mower that weighs 35kg and has a cutting width of 56cm. But is it a smooth operator? Self-propelled (so very easy to push). Height adjustment requires considerable effort. 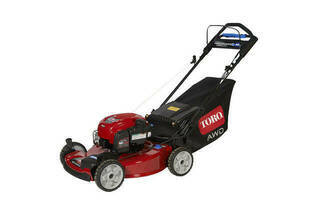 Limited cutting height range: can only mow down to 25mm (unusual for a petrol mower).